Drawing is sometimes seen as a mere “study medium”, but this course aims to explore drawing as an artform in its own right. We will begin each day with a themed presentation, exploring a broad scope of exciting possibilities and approaches to drawing, providing examples of historical to contemporary movements, artists’ work, their techniques and materials. This will be followed by a walk. Going out into the fresh air and openness of the landscape after the morning’s talk, will allow for space, thought, conversation and for ideas to distill, as well as provide an opportunity to collect materials that can be used as subject matter or tools on return to the studio. The remainder of the day will be spent in the studio developing new drawings. As the course progresses you will be introduced to techniques that are of a representational and descriptive nature, including some “tricks of the trade”, right up to exploring approaches that are more personal and expressive. Rather than relying solely on a traditional teacher-pupil dynamic, this course invites fellow group members to interact and discuss ideas and methods and, most importantly, to have fun! Beginners to advanced welcome. On enrollment, advice will be given in advance as to what materials and equipment to bring. Miriam de Búrca is a practising artist with a BA in Drawing & Painting, MA in Fine Art, and practice-based PhD in Fine Art. 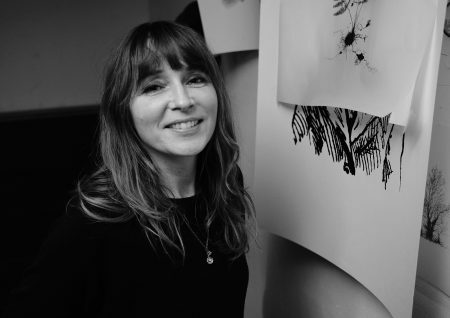 Her work has been shown internationally, in cities such as London, New York, Prague, Warsaw, Montreal, Tel Aviv and Berlin, and nationally including Dublin, Derry, Enniskillen and Belfast. She has worked extensively with film, video, and installation, but drawing has always been her passion. She believes drawing is an artform that deserves its own stage and enjoys pushing its boundaries and exploring its possibilities in the studio as well as in an educational setting.